Dishing out another superlative all-round performance, Mumbai Indians crushed Delhi Daredevils by 32 runs to virtually qualify for the play-offs of the Indian Premier League in Mumbai on Saturday. The win at the Wankhede Stadium meant Mumbai are back at the top of the leaderboard with 16 points from 10 games and have virtually booked a berth in the last four stage of the Twenty20 tournament. On the contrary, the loss has knocked Delhi out of the the May 24-25 play-off race and are languishing at the seventh position with eight points from 11 matches. 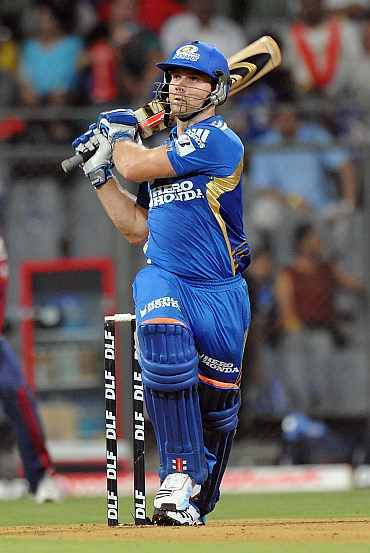 Invited to bat first, Mumbai rode on a blazing start provided by Aiden Blizzard, who blasted 37 in 23 balls, besides a belligerent 56-ball 87-run third wicket partnership between Ambati Rayudu (59) and Rohit Sharma (49) to post an imposing 178 for four. Faced with the huge task of chasing the stiff score, Delhi batsmen buckled under pressure and were tottering at seven for four in the third over before they recovered through an 87-run partnership between top-scorer James Hopes (56) and Y Venugopal Rao (37). But it was not enough as Mumbai shot out the visitors for 146 in 19.5 overs to suffer their seventh defeat in 11 games. It was yet another clinically efficient bowling display by Mumbai, who choked the Delhi dashers by packing off David Warner, rival captain Virender Sehwag, Colin Ingram and Naman Ojha within the first three overs. After Harbhajan Singh dismissed Warner off the fifth ball of the innings, Delhi soon slumped to seven for four. The visitors lost Ingram to Lasith Malinga's unplayable yorker before Munaf Patel sent off Ojha and Sehwag, to virtually seal off Delhi's escape route. The partial revival was led by Hopes, dropped at long leg by Munaf Patel off Malinga when on 23. He faced 44 balls en route to his fifty and struck eight fours before he was run out in the 17th over following a mix-up with Irfan Pathan. His fifth wicket partner Rao hit four fours and a six in his 27-ball knock before he was bowled by Dhawal Kulkarni in the 14th over when the Daredevils were on 94. Pathan made 23 off 18 balls and briefly threatened to take his team past the stiff target before he was yorked by Malinga in the 18th over when Delhi required 51 runs which virtually ended their hopes. Malinga, Munaf, Harbhajan and Kieron Pollard grabbed two wickets apiece for Mumbai, who clash with Kings XI Punjab on May 10 at Mohali while the Daredevils play against defending champions Chennai Super Kings on May 12 at the latter's backyard. Earlier, Blizzard blasted eight fours after singling out Morne Morkel for a harsh treatment by hitting the South African pacer for five fours in an over. Blizzard and Tendulkar (14) put on 50 runs in 29 balls for the opening stand and the fine beginning was later sustained by Rayudu (59) and Sharma (49). Rayudu cracked two sixes and three four in his 39-ball essay while Sharma struck three huge sixes and two fours in his 32-ball blitz after Delhi captain Virender Sehwag won the toss and opted to field in their must-win clash. Mumbai scored 49 runs in the last five overs and 102 in the last 10. Blizzard simply tore apart Morkel after playing three dot balls off the first three balls he faced from the lanky South African fast bowler. The 26-year-old Aussie, with limited first class experience, showed why captain Tendulkar preferred him as his opening partner by cover driving and pulling Morkel for successive fours in the opening over. Tendulkar then picked up the cudgels by driving Irfan Pathan and Ajit Agarkar for a boundary each to raise the team's 50 in only 29 balls before the former struck the first major blow by dismissing the champion batsman. Tendulkar was bowled by Pathan as he went for a wild heave on the leg side. Four runs later Blizzard was packed off by left-arm spinner Shahbaz Nadeem, one of the three changes effected by Delhi in their playing eleven. The batsman mistimed a pull shot and gave an easy catch to Sehwag at short mid-wicket. It was then left to Rayudu and Sharma, the two leading scorers for Mumbai after Tendulkar, to push the score along and they did not disappoint. 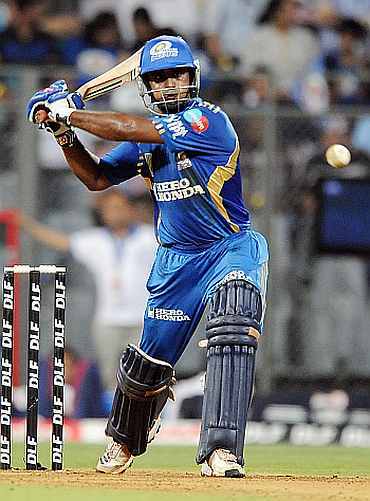 Rayudu struck Hopes for two successive fours to help Mumbai reach 76 for two at the halfway stage of their innings. Rohit then struck a glorious straight six off Morkel when he was brought back into the attack to help Mumbai reach the 100 in 75 balls. Rohit clobbered Hopes for two sixes over the straight field while Rayudu pulled him for a four in the 15th over at the end of which Mumbai were 129 for two. To add to Delhi's woes, Sharma was dropped at deep square leg by Warner off Pathan in the 16th over when the batsman was on 44. However, he was caught in the next over off the expensive Morkel at third man after adding five more runs. Rayudu, who reached his 50 in 35 balls by hitting Nadeem for a six and a four, struck Hopes for two fours in successive balls in the 19th before he was dismissed, caught by Sehwag inside the circle. 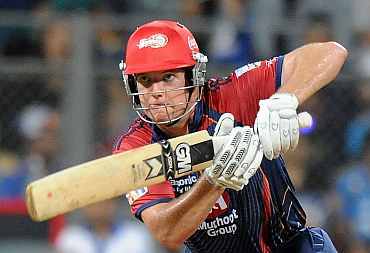 Morkel's four overs cost him a whopping 49 runs with a sole wicket to his name. Pathan was the most impressive with figures of one for 23 while Nadeem picked up a wicket for 28 runs. Hopes too was expensive with figures of one for 45.